Below is a newspaper article by the historian David A. Bell. DAVID A. BELL, the Andrew W. Mellon Professor in the Humanities who specializes in the history of France, has held fellowships from the National Endowment for the Humanities, the American Council of Learned Societies, the Woodrow Wilson International Center for Scholars, and the Guggenheim Foundation. He is a contributing editor of The New Republic and, in 2005, was a visiting professor at the École Normale Supérieure in Paris. Among his honors and awards is the Gershoy Prize of the American Historical Association, which was awarded in 2002 to his book The Cult of the Nation in France. Professor Bell has taught at Johns Hopkins since 1996. Bell's piece is relevant to peace through understanding because he suggests that the Enlightenment ideal of universal peace actually may have contributed to making war more barbaric and to greater demonization of the enemy. The basic idea is that Enlightenment thinkers convinced Europeans that war is barbaric and should be eliminated from relations among civilized states. So those who considered themselves enlightened but who felt a need to go to war sought to justify the needed war with the argument that the enemy threatened civilization. This meant that the enemy would have to be portrayed as truly monsterous, and that unrestrained efforts against the enemy would be justified. I'm not convinced that Kant is to blame. Even if, as MacIntyre has argued, the Enlightenment project has been largely a failure, it has also had some great successes; and if the promotion of the ideal of universal peace has not be an unqualified success, it remains a worthy effort. To support Bell's claims, we should find that people influenced by Enlightenment thought demonized their enemies more than previous propagandists, and conduct wars more ruthlessly. To undermine his claims, we might find other reasons for post-enlightenment demonization and violations of rules of jus in bellum. When we look compare pre- and post-Enlightenment depictions of enemies, I don't think that we will find the latter worse than the former. As for the savagery of war, it would seem more the result of technology that release from the bounds of the rules of war because of the seriousness of the threat of the enemy. Another reason might be that post-enlightenment wars have often been ideological rather than simply territorial. Perhaps when wars are seen as mere conflicts over territory or disputes over succession they would not lead to demonization to the extent that accompanies wars that are justified by ideological differences. It would seem that no proposed rule is without its exceptions, and generalizations in this area are extremely hazardous. Another way to argue against Bell would be to compare other practices condemned in the Enlightenment. Kant considered slavery at least as unethical as war. Did this result in greater de-humanization of slaves on the part of those who felt a need to keep slaves, or did it result in worse conditions in which slaves were kept? The barbarity of 19th century slavery seems more a result of the industrialization of slavery--the attempt to make use of slaves on a massive scale in order to maintain the cotton economy of the Old South--than a reaction to Enlightenment arguments; and it would seem that something similar is the case with regard to war. Still, Bell's argument should not be entirely dismissed. We should certainly admit the possibility that peace advocacy might have the unintended effect of prodding war pimps to more aggressive advertising, and this combined with the ideologically motivated condemnation of enemies might lead to more violations of rules of war. Bell might be read together with Mastnak for a hermeneutic of suspicion about peace advocacy. during the war against terrorism. threaten the existence of the United States. say that we are fighting World War IV (No. III being the Cold War). every adversary is an apocalyptic threat. paranoid aggressor that always overreacts to provocation. without at least one major European power at war. to treat the enemy as an honorable opponent. of modern total war have been bound closely to each other in the West. took on an especially hideous character. Hitler, not only in evil intentions but in potential capacity. a threat to our existence. 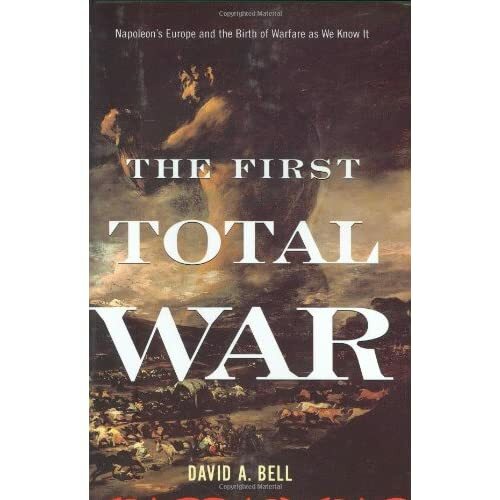 Total War: Napoleon's Europe and the Birth of Warfare as We Know It."